Getting my mother to share her recipe was a cinch. On the first day of 2011, having accurately guessed that the night before likely would have taken a toll on her daughters, my mother rose early and made her watercress soup. The process is super easy — the hardest part is separating the watercress stalks from the leaves, which should take just one clean whack. Once that’s done, you simply put 20 cups of water in a pot and bring that to a boil, then toss in the stalks and pork. “The stalks take longer to soften,” my mother explains. If you throw the leaves in at this point, too, they will likely be mushy and too soft to eat by the time the soup is done, she notes. “If you don’t want to eat the leaves, then just put it all in at this point,” she says. Once that’s boiled for about 20 minutes, you put in the Chinese “almonds” (which are actually apricot kernels, even though they’re labeled as almonds in Asian grocery stores), preserved dates and the leaves, boil the concoction for 90 minutes and the soup is ready to go. My mother likes this soup because the Chinese believe that watercress and almonds are supposed to be good for your lungs and respiratory system. And, she likes to note, I’m terribly prone to coughs. Health reasons aside, however, this soup is delicious. When made well, this watercress soup tastes meaty, green, savory, slightly earthy and sweet all at once. It’s lovely on its own but fantastic scooped over white rice as well. Now if only all medicine tasted this good. Bring water to a boil in a large pot then add the watercress stalks and pork bones. (If you are not planning to eat the leaves, they can go in at this time, too.) Bring this to a boil and let it simmer for 20 minutes then add almonds, dates and leaves if you didn’t add them earlier. Reduce heat to low and simmer for 1.5 hours. Add salt to taste and serve. This entry was posted in Asian, Cantonese, Chinese, Let's Lunch, Recipes, Soup by Cheryl. Bookmark the permalink. My mom always cuts the dates of your hand – I think it believes they will release more flavor that way. Let me know how your visit, and the cough is better … Thanks! Hi Cheryl, I enjoyed meeting you at the YWCA evening – your food was delicious. I am the Italian cook who was asking for Chinatown store addresses. Also I particuliarly liked your Spicy Chinese Watercress – could you give me that reciepe? Lovely to meet you, too, Leith — hope you enjoy the book! I thought my mother-in-law invented watercress soup until I found this post! 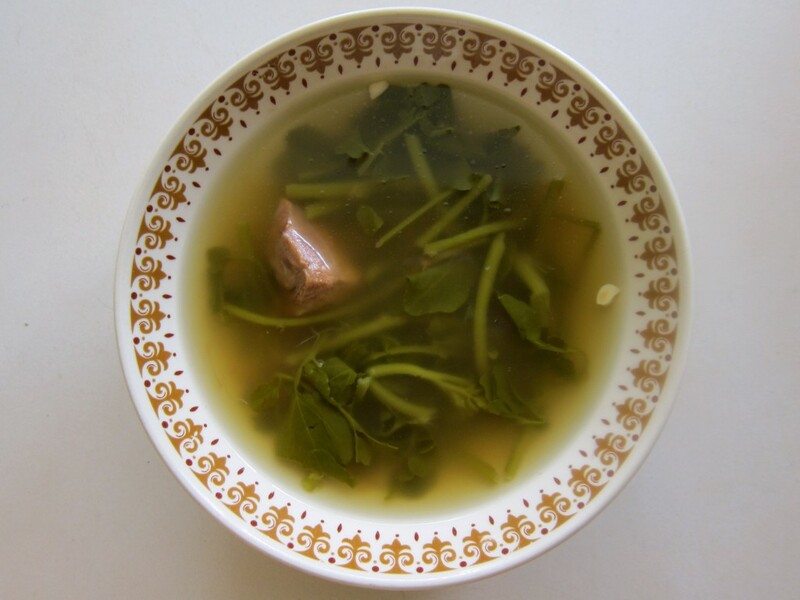 I’m in the process of documenting my in-law’s Chinese recipes and watercress soup is on my to-do list (my father-in-law recently retired after 20 years of owning a Chinese restaurant). I love watercress soup. It just seems to clean your system and your soul. Glad to have found you. Wonderful recipe! You can read how I adapted it on my blog.